Marjorie Kennedy Seymour, 99 years of age of Hurley, VA, passed away Tuesday, January 29, 2019 at her home. Born April 27, 1919 in Blackey, VA, she was the daughter of the late John Kennedy and Olivia Pennley Kennedy. 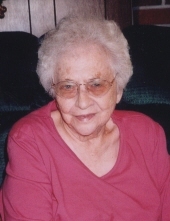 Marjorie loved going to church and spending time with her grandchildren, was a member of Blackey Baptist Church, and enjoyed working outside in her flower garden. A loving mother, grandmother, great-grandmother and sister. In addition to her parents, she was preceded in death by her husband Willie Seymour, and three sisters. Survivors include her daughter Susan Easterling and husband Ted of Blacksburg, VA; son Danny Seymour of Hurley, VA; sister Opal Stiltner of Abingdon, VA; grandchildren: Dana Seymour, Alisa Cowan, Toran Whitt and husband Dustin, Sherry Seymour, Danny Seymour, Jr., Katy Seymour, Johnathan Seymour, Aaron Easterling, and Shannon Easterling; several great-grandchildren and friends. Funeral service for Marjorie Kennedy Seymour will be held at the Shortridge-Ramey Funeral Home Chapel of Grundy, VA, Saturday, February 2, 2019 at 12:00 noon with Pastor Jamie Sexton officiating. Burial will follow in the Stiltner Cemetery on Poplar Creek Road, Grundy, VA. Active pallbearers will be her family and friends. The family will receive friends at the Shortridge-Ramey Funeral Home Chapel, Friday, February 1, 2019 at 6:00 p.m. with evening service to be held at 7:00 p.m.
Online condolences may be sent to www.shortridgeramey.com. The family of Marjorie Kennedy Seymour have entrusted the care of their loved one to Shortridge-Ramey Funeral Home of Grundy, VA.
"Email Address" would like to share the life celebration of Marjorie Kennedy Seymour. Click on the "link" to go to share a favorite memory or leave a condolence message for the family.